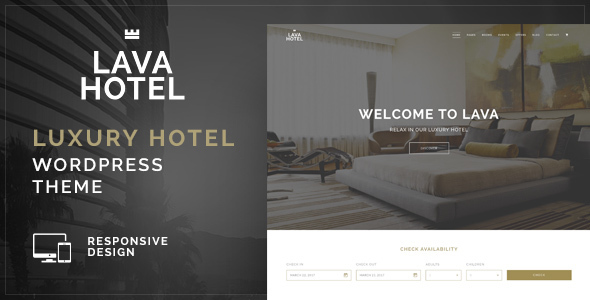 Lava is a high quality WordPress theme for hotel, hostel, resort, vacation room/apartment rental services. Theme is fully integrated with a powerful Hotel Booking system, youâ€™ll be able to manage room listings, customer bookings, payments and coupons etc. with ease. Lava embraced modern web design concepts which brings a unique feel of elegance, luxuriousness and pleasantness to site visitors. Theme is also highly customizable, and easy to use. Itâ€™s the perfect hotel WordPress theme to showcase your services and attract more customers. Get it NOW and start to build something amazing with this theme. All theme support are conducted through our Support Center, please feel free to submit a ticket if you need some help. Images used in the demo are for preview purpose ONLY, itâ€™s not a part of the theme package.